Union Pacific's Granville job, LPA70, heads back to Butler on the Granville Industrial Lead. 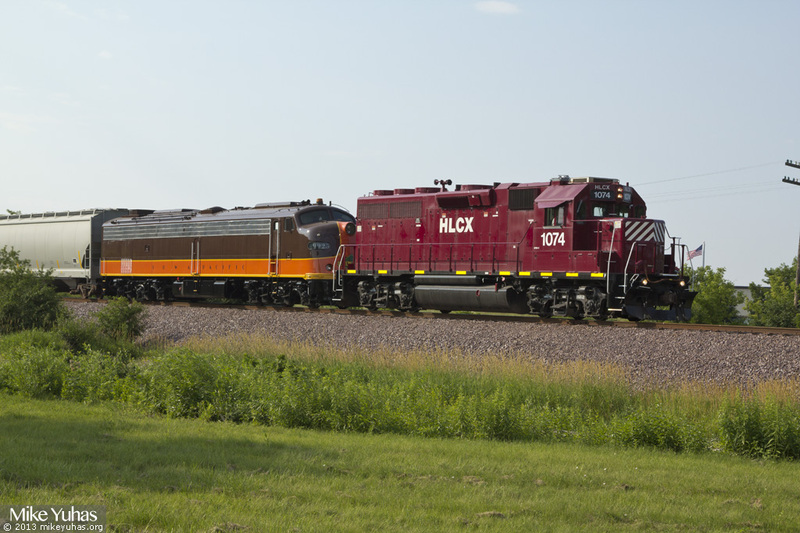 Power is HLCX GP38-2 1074 (a former D&RGW GP40 now classed as a GP38-2) and Iowa Pacific's SLRG E9 9925. Both units have been recently painted. The HLCX unit got a fresh coat at Metro East in St. Louis in March (see Mark Mautner's photo), and the SLRG unit at WSOR's Horicon shop last week (see f_units's pic from sunrise today). The E-unit was interchanged to UP by Wisconsin & Southern at Granville yesterday.